Jared made some phone calls to get prices of things for the new place. He called the water company about a water meter and that is going to cost $2119. Good thing we are on this side of the road or it would be an additional $1100. He called the electric company but we have to know exactly where the house will go before we can set that up. We have to pick up paperwork for the driveway to get approved. We buy the culvert and it should be installed the same week it gets approved. I have no idea how much a culvert is. Today was the home inspection. Well, let me back track. Yesterday we got a confirmation about the foundation inspection from 11-1. We then received a confirmation about the home inspection from 1-4. That was putting me and the boys out of the house for at least 5 hours. We asked if they could make one of them the following day so that it wasn’t all wrapped up in one day. They came back and said no please there’s no other days available. So we decided to go to work with Jared the next day (an hour away) and with not good a/c but I really didn’t want to do anything else. So the foundation inspector comes and does his thing. He says we have a 6 inch tilt in our foundation and thus we have an issue. Their realtor kind of freaks out a little and before even talking to the client CANCELS the second inspection. She then talks to the buyers and they are still interested in the house (as long as we are fixing said foundation ‘problems’) and wanted the appt back. They weren’t able to get their appt back and will have to reschedule for another day. I was SO irritated. Okay maybe not SO irritated but no yes I was pretty irritated. We had already gone out of our way and then the crazy lady cancels it. So not only was it cancelled but we have to figure out what is up with our foundation. We had 2 of our own foundation inspectors come out for second opinions. One said they ‘might’ stabilize and the other said they wouldn’t even touch the house for fear of messing up the plumbing because there’s no way the foundation has problems. We have one small crack in the living room but no major cracks and no doors messing up, which is apparently what would happen if we had issues. (Not even during weather change) So now we have a structural engineer scheduled to come next week for the final say so. I thought this was going to push back our closing date but we got word that it hasn’t. Our closing date is still July 28th!! EEEK! 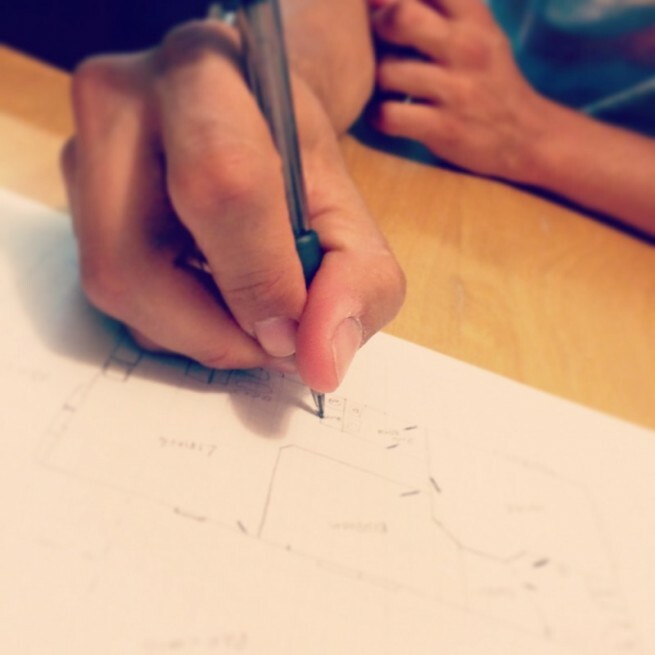 We finally drew up some house plans we were happy with and took them to Miller’s Metal Buildings to get a quote. The guy was out of the office so we just left them on his desk. We got a quote in email on the metal building! It’s around 18K and that’s in the ball park of what we were expecting. We have 7 days to put down 1/3 of the payment and that locks in the price (so the materials don’t go up) but it also takes 10 weeks from the time we pay until they can start building it. That’s 2.5 months!! So we need to make a decision asap. My parents have neighbors that their parents have a metal building on the land behind them. We went over to look at their place and ask them what they like/dislike and what they would do differently. It was pretty neat to see but actually it looked just like any other house. Their’s wasn’t as small as ours will be but it gave us a great idea of it. We also showed my step dad our floor-plans and he said they look good! It was kind of funny because we ended up adding in a half bath because we couldn’t find a good fit for our bathroom to be accessible for company. I was worried that I was being too greedy by wanting a half bath and wasn’t sure what he would think. He thought it was a great idea though and makes me feel much better and less greedy. It’s going to be a half bath/laundry area. So cute & so exciting!